Sign In FIRST, then view your Order History to find out. You can find these links under the SHOP menu. Your bank routing number is a nine-digit code that's based on the U.S. Bank location where your account was opened. It's the first set of numbers printed on the bottom of your checks, on the left side. Your account number (usually 10-12 digits) is specific to your personal account. 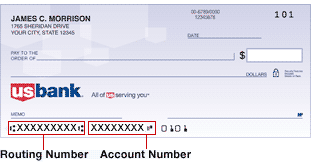 It's the second set of numbers printed on the bottom of your checks, just to the right of the bank routing number. CHECK NUMBER: If you do not have a check then just use the date without the "/" and without a beginning 0 as the check number ( 01/01/2019 = 10118 ), if you do have a check then use the smallest number at the bottom of your check or at one of the top corners.